This PDF 1.3 document has been sent on pdf-archive.com on 16/05/2012 at 20:47, from IP address 137.82.x.x. The current document download page has been viewed 1197 times. A new step towards controlling neuronal differentiation? 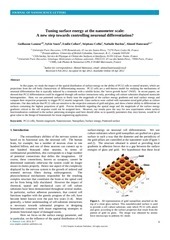 great value to the design of biomaterials for tissue engineering applications. oriented nervous fibers during embryogenesis. substrates have been demonstrated throughout several studies. promote functional repair of damaged axons. force microscopy in ambient AC mode. 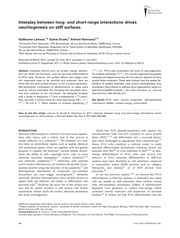 © 2012 Simplex Academic Publishers. All rights reserved. nanopillars in distinct patterns. All pillars have a height of 20 nm. Slide #2, both the period and the diameter of pillars are different. 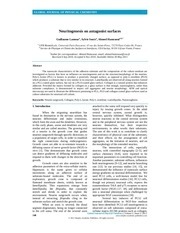 between surface energy distribution and cell behavior [1-3]. is made of a monolayer of pure gold. initially. The cell density at the time of seeding was ~104 cm-2. Observations were made on the 6th day of culture (Figure 4). each slide to check the reproducibility of the observations. This suggests that soluble factors (e.g. which are in turn stimulated in growing neurites. are not at the right scale for the sake of clarity. or whether any surface heterogeneity might be involved. 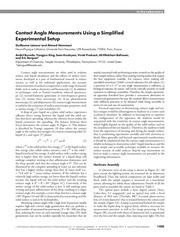 regardless of the area of nanopillars considered (Figure 4). groups  in similar growing cell culture conditions. B. Kasemo, J. Prosthet. Dent. 49 (1983) 832. M. Long, HJ. Rack, Biomaterials 19 (1998) 1621. M. Sastry, Langmuir 21 (2005) 10644. C. Staii, C. Viesselmann, J. Ballweg, L. Shi, G. Liu, JC. AS. Badami, MR. Kreke, MS. Thompson, JS. Riffle, AS. Goldstein, Biomaterials 27 (2006) 596. EV. Romanova, SP. Oxley, SS. Rubakhin, PW. Bohn, JV. Sweedler, Biomaterials 27 (2006) 1665. M. Mrksich, CS. Chen, YN. Xia, LE. Dike, DE. Ingber, GM. Whitesides, PNAS 93 (1996) 10775.
on the adhesion and on the differentiation of PC12 cells. 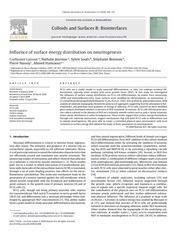 G. Lamour, N. Journiac, S. Souès, S. Bonneau, P. Nassoy, A.
Hamraoui, Colloids Surf. B 72 (2009) 208. 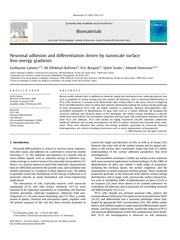 G. Lamour, A. Eftekhari-Bafrooei, E. Borguet, S. Souès, A.
Hamraoui, Biomaterials 31 (2010) 3762. G. Lamour, S. Souès, A. Hamraoui, J. Biomed. Mater. Res. A. This file has been shared by a user of PDF Archive. Document ID: 00040787.